Just when a narrative was beginning to form that Hillary Clinton had regained her “inevitability” and might romp to the Democratic presidential nomination, a batch of new polls have come out showing Bernie Sanders to be in very good shape in the first two states. On Sunday, an NBC/Wall Street Journal/Marist survey came out showing Clinton’s robust pre-Christmas lead in Iowa shrinking to 3 percent. PPP showed Clinton up 6 in Iowa, but had her up 18 just a month ago. 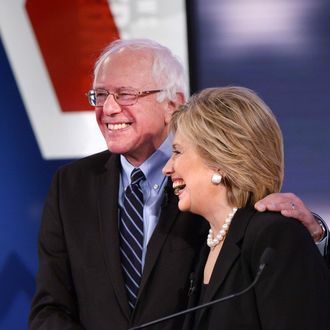 And then two polls — from ARG and Quinnipiac — showed Sanders actually leading in Iowa. Meanwhile, four of the last five polls to come out in Sanders’s best early state, New Hampshire, showed him back in the lead; two recent polls, from Fox News and Monmouth, put him up by double digits. So it’s the Sanders Surge, right? Well, maybe; some hype about his polling revival in Iowa and New Hampshire was definitely going to emerge from Team Bernie, which needed a fresh fix to fuel its Enthusiasm Machine, and from Republicans, for whom any bad news about Hillary Clinton was likely to inspire snake-dancing through the studios of Fox News. But even Clinton’s campaign could find something positive in the new numbers: a big change in the expectations game lowering her bar for success in the first two states. What we really need to know is whether the Sanders Surge, such as it is, extends beyond New Hampshire to those states where Clinton’s big advantages among minority voters gave her what appeared to be a firewall, even if she lost both of the first two states. Specifically, we could really use more data from Latino-heavy Nevada and African-American-heavy South Carolina, where sparse polling has given Clinton a big lead, and perhaps from some of the March primary states that also have sizable minority populations. Right now the score technically remains nothing-to-nothing. And that’s as close as you can get.